The late Wayne Hypes (left), Allan Bocock, Jr. and Bobby Whitescarver in 1990. 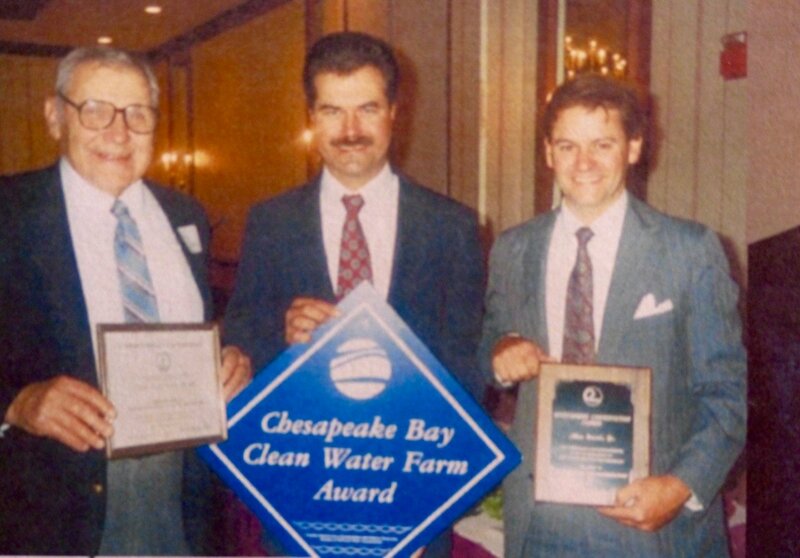 Allan received the Chesapeake Bay Clean Water Farm Award for his soil conservation measures. Allan Bocock was a grain farmer in Stuarts Draft, Virginia. He planted over 1,000 acres of annual crops each year including corn, soybeans, wheat, and barley. I met Allan in the late 80’s when I moved to the Shenandoah Valley as a District Conservationist for the Soil Conservation Service (SCS). This is the true story of his journey from excessive soil erosion to building healthy soil and how the next farmer – destroyed it all. I met Allan during the rollout of the 1985 Farm Bill known as the Food Security Act. It was the first time in US history that USDA benefits to farmers were tied to soil conservation. As a result of this law, Soil Conservationists in the Soil Conservation Service were responsible for identifying annual crops grown on “Highly Erodible Land,” informing landowners of this determination and then calculating their current rate of soil erosion. I was in charge of this process in the Headwaters Soil and Water Conservation District. How much soil can one afford to lose through the acts of erosion and still maintain productivity indefinitely? There is a term for this in soil science called the “Tolerance” value or “T” for short. It’s expressed as tons per acre per year. A ton of soil is about the thickness of a sheet of paper covering one acre; roughly the size of a football field. “T” values range from one to five tons per acre per year. All of the soils in the United States have been mapped, named and analyzed. There is a “T” value for every soil. The data is online at “websoilsuvey”. The first step in soil conservation on cropland is to make sure soil erosion is at a soil’s “T” value or less. For example, if a soil’s “T” value is two, one can afford to lose no more than two tons of soil per acre per year and still maintain productivity because natural processes will make two tons of soil per acre per year. If one farms in a manner that is below the “T” value, then there will be a net gain in soil. This is the sweet spot in soil conservation – building soil. If one farms in a manner that exceeds the “T” value there will be soil movement downslope. Inevitably this soil will enter a ditch or nearby stream; thereby becoming sediment; the largest pollutant by volume in America’s streams, rivers, estuaries, and lakes. Congressional debate prior to the passage of the 1985 Food Security Act was exhaustive. The environmentalists argued that soil erosion on annual cropland should be at the “Tolerance” level for Highly Erodible Land to receive USDA benefits. The farmers and their lobbyists, on the other hand, didn’t want to have anything to do with more regulation. Farmers loath the thought of some government bureaucrat calculating the amount of soil erosion taking place on in their crop fields. The result was what I call the “great soil erosion compromise”: The US Farm Bill, still to this day, allows farmers to have twice the soil erosion on their “Highly Erodible Land” than what soil scientists believe is sustainable. We refer to this as “two times ‘T’” or 2XT. This provision in the law may have been a good example of compromise and democracy, but it was a deplorable example of sustainability. In soil conservation, we have a method to calculate a farmer’s average annual soil loss called the Universal Soil Loss Equation (USLE). It uses six factors that can guide us in developing a cropping system that reduces soil loss to sustainable levels, or to “T”. When I started with the Soil Conservation Service in 1980, we used a slide rule to make the calculations. Today we use the computer and as one can imagine it has become much more complicated. Universal Soil Loss Equation slide rule calculator used in the 80’s and 90’s to determine average annual soil loss on “Highly Erodible” cropland. During the rollout of the Farm Bill, I determined that Allan Bocock was indeed planting annual crops on “Highly Erodible Land” and following government procedure at the time, I sent him a certified letter informing him of this determination. Even worse was the fact that he was farming Berks-Weikert, a soil which is shallow, born from shale and highly erodible. This soil has a “T” value of 2 tons per acre per year. It was a warm and sunny day when I met Allan. I drove along a dirt road to Allan’s farm and turned into the driveway to his shop. He was a tall, slender man in his late thirty’s with dark hair and a mustache. Hard working, he had black engine grease on his hands. He wiped his hands with a rag and extended one to me. He showed me around his farm, and I used the USLE slide rule calculator to predict the current average annual soil loss on each of his crop fields. Allan was farming each crop field in one crop. Wheat here, corn there, soybeans somewhere else, etc. and he was using tillage only when he thought it was necessary. His average annual soil losses were high – exceeding 9XT or over 18 tons of soil loss per acre per year. He was on a downward slope to ruin. As one loses more and more soil, the soil’s productivity decreases and more inputs like fertilizer are needed to produce the same yields as the year before. The top ton of soil is the most productive ton. We would have to enlist every Best Management Practice (BMP) I knew of to get him down to “T.” When I explained to Allan about soil health and his calculated soil losses he understood. His desire was to build soil, not have it wash away into nearby streams. He was an excellent candidate for contour strip cropping. Contour farming (across the slope of the land) reduces erosion in half all by itself and increases soil moisture by at least two-fold. 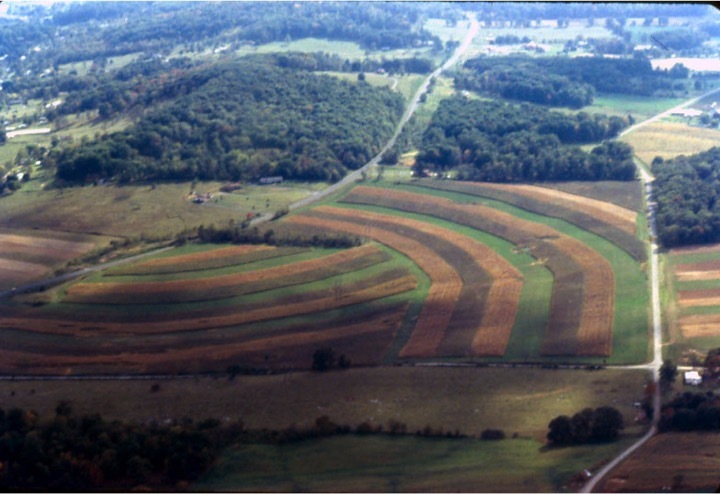 By adding strips, or bands of crops alternating with perennial crops it reduces soil erosion in half again. Adding no-till, cover crops and leaving crop residues on the land we could start the process of building soil and soil health. It took us several years to lay out all his land in contour strips. What resulted was a beautiful landscape of sinuous bands of annual and perennial crops winding their way across the slopes. It was a conservation cropping system; a combination of conservation measures in concert working to produce food, healthy soil and clean water. This contour strip cropping system on Allan Bocock’s land incorporates many Best Management Practices. Allan was not only in compliance with the Farm Bill; he was on his way to lowering his input costs and higher profits. As soil productivity increases so does profit. As time went on Allan came to see me several times and told me his yields were going up, and his soils were improving. A couple of decades later Allan and his wife bought a farm in the Midwest and moved. He rented the Virginia farm to another farmer under the condition that the farmer remains in compliance with the Farm Bill. That farmer came to see me. He stated he wanted to take the contour strips out and plant all the fields in just one annual crop, and he would use pure no-till in all his operations. I told him I didn’t think that would work on those very erosive soils but would run the numbers and get back to him. Well, since the first time I worked with Allan in the late 80’s, the Universal Soil Loss Equation had undergone two revisions. We were in the process of being certified in using the new “Revised Universal Soil Loss Equation II” or RUSLE II for short. Using the new figures in RUSLE II, “that farmer” had an average annual soil loss of four tons of soil loss per acre per year. In other words, he met the provisions of the 1985 Food Security Act – 2XT. I tried my best to convince “that farmer” that what he was about to do was not sustainable. We talked about building soil and productivity. We talked about runoff and soil erosion. My salesmanship skills were insufficient and to my chagrin, all the contours, all the strip cropping, all the perennial crops were ripped out, and all the land was planted to one annual crop. Reduced tillage and no-till are good practices, but we should not rely on these alone to do the important job of building healthy soil and improving water quality. 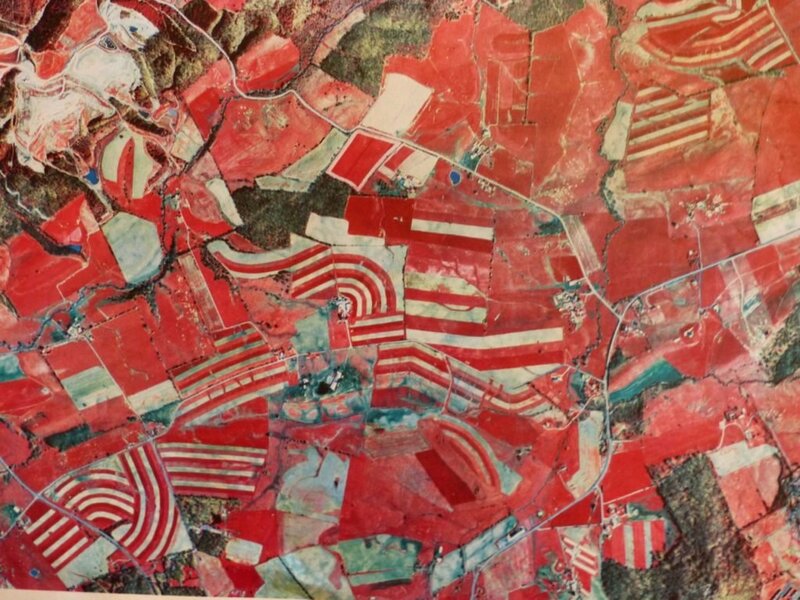 Aerial infrared photo of the Stuarts Draft, VA area showing many of the contour strips on Allan Bocock’s land. All of them have been destroyed and planted to one annual crop each year. This farmer and many others like him are able to continue receiving USDA benefits while their calculated annual soil loss is twice what we know is sustainable. The US Farm Bill is renewed every five years. It’s time to gear up for the next one and time to change the requirements in the law that to receive USDA benefits, soil erosion on annual crop fields must be at “T” or below. On their farm in the Midwest, Allan, and his wife Linda continue to use Best Management Practices on their land producing food, healthy soil and clean water. Once again you are right on target with this article. As a former NRCS DC, I also planned to 2T which was not sustainable. How do we get this changed? Rich, dialogue is going on right now for the Farm Bill. Contact your legislators. You touched a nerve Bobby. T has always been controversial to me and the 1985 Farm Bill allowed farmers to erode the land while maintaining their farm benefits. I came to the conclusion that one cannot legislate conservation through government programs. I was just describing our soil loss calculator slide rule to a fairly new area resource con friend in Missouri a couple weeks ago. No till has allowed us to maximize productivity on marginal soils in the short term. It is not a universal fix. I have seen huge gullies underneath corn residue before. I wrote a reply to the Contrary Farmer a few years back that may still be on the Google search. I have the same feeling seeing all my efforts with CRP and CREP in this area with the loss of those contour strips. Dad and Grandpa did it much better than this latest group who are financed to the hilt and struggling to make ends meet. Jim, thanks for your input. Very timely. Fantastic article, Bobby. Very interesting stuff. I hope folks step up and make their voices heard with this Farm Bill. The Farm Bill is a beautiful thing, when used correctly. Michael, thanks for your comment. I agree. The Stuarts Draft area is destined to grow houses. Future citizens of the U.S. will rely on other countries for food. How tragic. Walter, that same area had the most USDA prime farmland soil in the County. We paved it over. Bobby: Thanks for raising this really important conversation. I’d also mention that, While we also talk about conservation plans and T as water quality objectives, T is really about maintaining sustainable soil productivity. There’s never been any study that indicated that a soil loss of T is enough to protect water quality (and I’d argue that it doesn’t). With everything we’re learning about improving soil health, cover crop / no-till systems, soil carbon, and our ability to dramatically improve our infiltration and reduce soil loss. I’d argue that, in the interest of both production and water quality, we should be shooting for systems do better than T – and that we can achieve them with good outreach, education, and implementation. Matt, thanks so much for your input. I totally agree. We have a saying in soil conservation, “get to T, manage for C”, where the C stands for carbon. The soil can hold twice the carbon than all the higher plants put together. Thanks for writing this. I’ve shared it on Twitter. Thanks, Katie! And thanks for posting this on the blog. Good grief. If I am not mistaken poor soil conservation leads to famine (see African famine stories). Good article. Yesterday I listened to a Congressman espouse deregulation of the coal industry. I am sure he would want to deregulate farming, as well. What I took away from the presentation was his willingness to strip mine, which destroys streams and rivers (and forests) so we could continue to burn coal, as opposed to supporting sustainable energy solutions. I believe he also supports the pipeline across Virginia. Back on point I don’t understand how you can ignore a practice that increases productivity while building soil while continuing a practice that surely degrades your ability to produce. Oh, and save the sturgeons! Thanks, Charlie for stopping in and posting your comment. Spot on! Clean Biomass cooking is no small thing. has very exacting analysis of biomass usage & sources, energy & emissions. Also for Onion farmers in Senegal and Peanut farmers in Vietnam. TLUDs, (Top-Lite Up Draft) Cook Stoves for the roughly 1 billion folks world wide now using open burning. Showing sequestration of 130 Million tons of Biochar per year, could be achieved just from cooking. In terms of CO2e, these 250M Households reduce 825M Tons of CO2e annually. The cascading pulmonary health benefits for woman & children is the very thick icing on this nearly 1/2 GtC Soil Carbon Cake. Soil Biology is our only way to rapidly and massively draw down CO2 from the air to offset our ongoing and past carbon emissions, It Can safely and naturally restore the hydrological cycles by increasing biogenic aerosols and cloud albedo that can readily cool the planet by the 3 watts/m2 needed to offset the now locked in greenhouse warming effects and avoid the Storms of Our Grandchildren. The French have lead the way recognizing Soil Carbons’ value and committing to build Soil Carbon by 0.40% annually. Putting them on the road to Carbon Negativity before any industrialized country. 25 nations have signed on to 4p1000. 100 of the 196 countries in Paris submitted plans to reduce CO2 via agriculture, forestry and replacing soil carbon into their programmes. Erich, thank you so much for your comment! I’m totally on board with pumping carbon into our soils via plants. It is ludicrous that folks can receive USDA benefits for having twice the amount of sustainable soil loss. Having higher standards would motivate farmers to use BMPs and practices that build soil. Like Allan experienced, increased productivity and soil improvement come with the implementation of these practices. There are so many good reasons to use BMPs and farm sustainably, but with all of the bureaucratic setbacks and wealthy farm lobbying firms it is hard to create the shift that we need. You make a lot of good points in this article, but you totally missed the one that is a major contributor to “this farmer” switching to a monoculture. Its called the Renewable Fuels Act, and has been doggedly perpetuated by the Obama administration. Sadly this is the lefts typical feel good position on environmental issues. This mandate has taken more ground out of crep, plowed up more grassland, done more to set back water quality and conservation than any legislation in a generation. Even an uneducated, deplorable, Trump voter such as myself can see that this policy is unsustainable and anti clean water. Call me a conservative who is for clean water! Buff, thanks for stopping by and for your spot on comments. Deplorable, uneducated??? I don’t think so. If the Donald put SOIL Carbon on his agenda, as the conservatives in Oz did to end the liberal carbon tax with their “Carbon Farming Initiative”, I would become a “Deplorable” too.